Sukkoth 5767: It was the nicest weather we have had for sukkoth in ages. We sat with friends in the Sukkah all Sunday afternoon. They we sat outside the Sukkah. Then we played frisbee. Throughout we ate copiously, starting with Judy's sweet kugel. 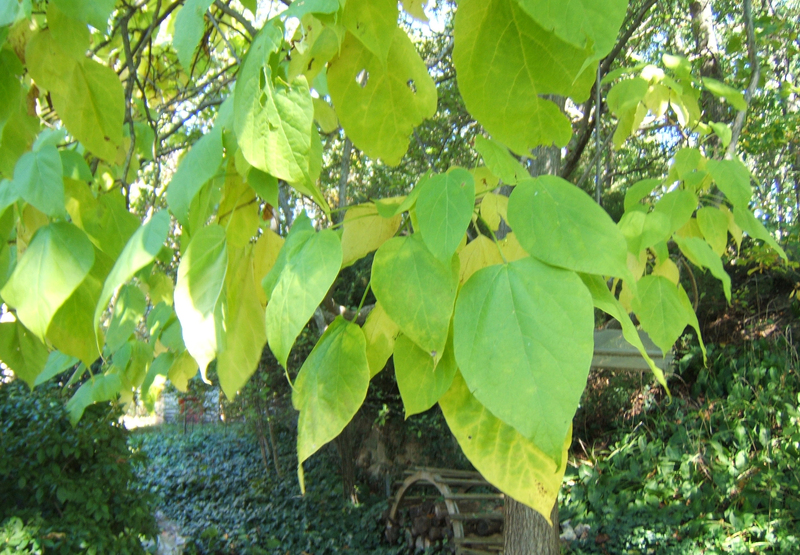 The leaves have barely started turning in our yard, and indeed, one tree with particularly large, almost heart-shaped leaves, attracted everyone's attention. At some point we realized that nobody knew what the tree was. 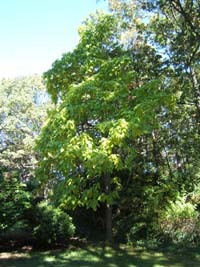 Judy inherited the tree when she bought the house over a decade ago. The husband of the original owner had been a gardner and we figure that he planted this ornamental tree, but he died a decade before she bought the house from his wife. Now we're actively curious. 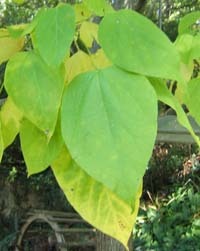 [Tree identified by the folks at Harvard's Arnold Arboretum, among others, as Catalpa Speciosa. Invasive species. Oops. 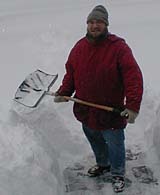 Shoveling the front walk, 30 Dec, 2004. 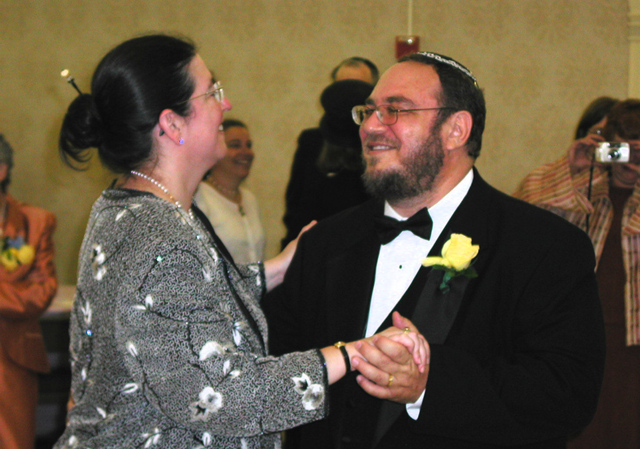 Judy and I dancing at our wedding, July 28, 2002. 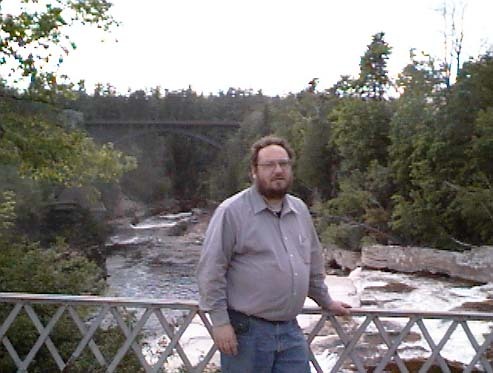 Hanging out at Ausable Chasm, in the Adirondacks, spring 1998. Dec 2004: When I moved to Massachusetts, I swore that if winter ever returned to normal, I reserved the right to reconsider leaving California. Over on the side you can see me shoveling about two feet of snow in late December. 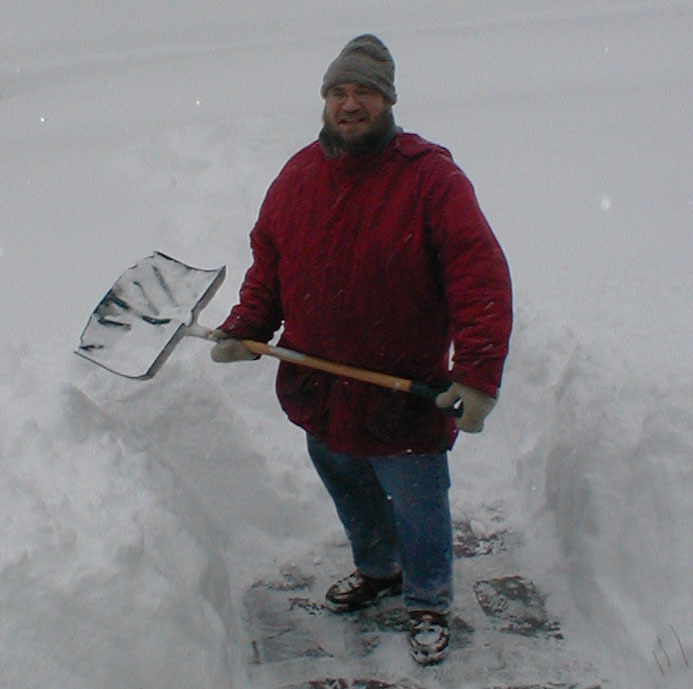 It was early in the season to become tired of shoveling snow. And there was more. As I type this in April, I recall that just a few days ago I saw snowflakes descending, hopefully for the last time this season. But, now it's mostly spring and there is plenty of reason to enjoy being in New England (starting with Judy). 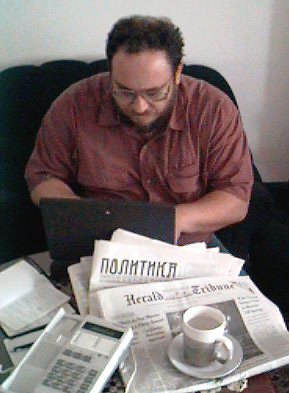 May 2004: It is about time that I started a Hebrew Type blog. Where else to put it but on my ivritype site - ivrit type is the words "Hebrew Type" in Hebrew. I am hoping to change that whole ivritype site into a place that focuses on my work on "tools for reimaginging Jewish"—my idea for years has been that we are re-engaging in the cultural rethinking that was cut short by the Holocaust. Judaism and Jewish community were undergoing radical change until Hitler enforced most radical change and murdered the communities. Here in America, especially, that dialogue has resumed. Computers give us tools for sharing Hebrew, community (esp. online) at a time when most of us no longer engage in these discussions with our immediate neighbors. That's what the ivritype site was meant to be about. Unfortunately, I never found a way to get that work to pay bills, and other priorities have come first. Jul 2002: Judy and I got married on July 28. It was a small wedding, mostly with immediate family. I'm not sure if it says much about the size of the wedding, or the degree to which we just don't drink anymore, but the liquor bill for the entire weekend totalled just over a case of wine, a lone bottle of champagne, and yes, one bottle of 16-year-old Lagavulin. Aug 2001: After a few decades of trying new stuff, I finally tried something a bit more mainstream and got a BA this past June. It's interesting not to have that "some of us don't need degrees" thing to kick around any more. I still don't need a degree, but I've got one now, anyway. And I'm going for the next one, by gum. I'm having too much fun to stop now. Check this space in about three years and maybe I'll have something to say about my masters. June 2000:I update this page so infrequently, that I'm going to start dating my changes. In any event, Judy got to give a talk at the 3rd London International Jewish Music Conference on "Jewish Music and the Internet", so I tagged along, ostensibly to hang with the kids. Actually, they did fine having adventures around town on their own, and I spent the week bathing in good papers on all sorts of Jewish music, much of which was entirely new to me. Between our Bed and Breakfast, and the University of London, was Tavilstock Park. 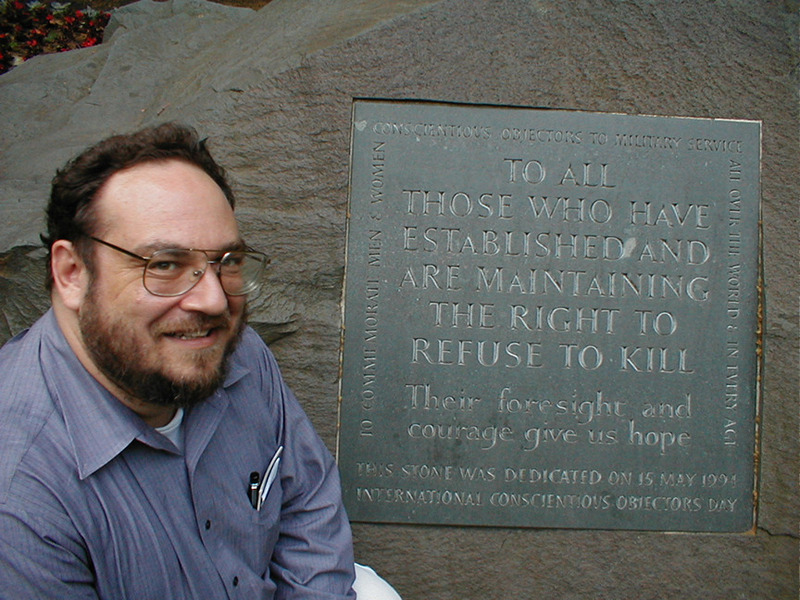 It was the first park we explored together, and I was quite touched to find a memorial to conscientious objectors. As a CO (Israeli army), it was a meaningful grounding point to be introduced to London in this park with a shrine to Gandhi, and several trees planted to honor folks who elsewhere and elsewhen might have forced memory by being immortalized in marble. Lunch times, as I discovered, the park is quite crowded. Spring 1999: I don't update this page often. 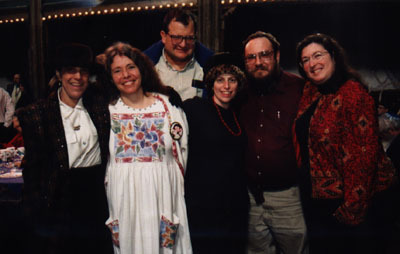 But, I finally got a picture of Judy and I and several of the friends I hung out with in Jerusalem, back in the early '70s. The occasion was the Bar Mitzvah of one of our sons, and it was a nice excuse to get together again. The band, of course, was the Metropolitan Klezmer band, the Bar Mitzvah boy did very well, indeed. A good time was had by all. For other family news, my niece Rahbie, now has her own scrapbook, and along similar lines, I've documented the family seder (family="descendents of Frieda and Isidore Davidow who happened to be on the East Coast this season"). If you are family, I expect you to kvell and get your own pages up. My most recent big trip was to Eastern Europe. This was the trip that convinced me to leave California and drive the zig-zagiest cross-country 6,000 mile direct route possible and move to Boston via Seattle and Tucson and Toronto. But what is documented here are the pages and pages of photos and writing done during a couple of months when I had no responsibilities but my own desire to travel and to talk and to listen and to write. Kent, UK, to Hamburg and on to Belgrade via Budapest, thence on to Sarajevo.... At some point, I stopped writing. Sometimes we all need a Sabbatical. This was a particularly good one. The most popular set of pages is the klezmer shack. If it's remotely about klezmer, this is where you'll find out about it. There are links to a couple of different discussion forums so that you can talk things out, as well. Take a look at the "klez top ten!" 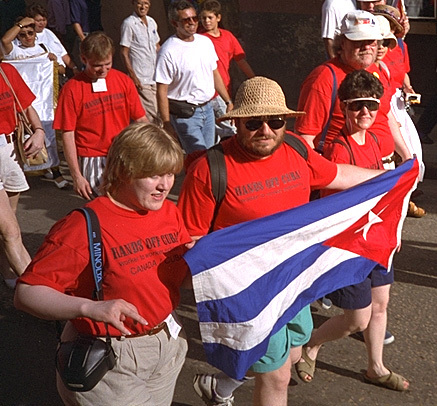 The Jewish conference on the WELL began in January, 1987. We're still going strong, and every year things are just a little bit different. There is no online Jewish discussion area quite like this anywhere. It's worth getting a subscription to the WELL for. The web presence is just a hint, not the real thing, unfortunately. Every so often I do some writing, or put out a broadside for fun. I do a lot of writing online, on the WELL, but these are times when I get to kick out the jams and really have fun. I've started gathering some of these online. Hope you enjoy! For my Jewish holiday toolkits, and the slow accumulation of writing and resources about technology, online conferencing, typography, and multilingual typography, see my ivritype web pages. As I get time, this will be the home of my professional writings. Right now, it is more an adjunct to here. More to organize in my copious space time (imcst). My father died of a sudden heart attack while visiting Eilat with my mother and sister (in celebration of my mother's birthday) on 4 April, 1997. 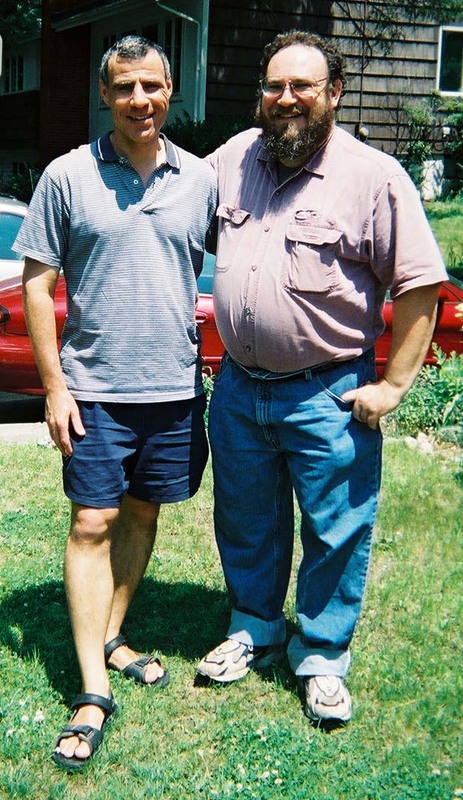 I'm not ready to put up materials memorializing him, but here are notes and photos from a trip the four of us made in September 1995 in which he showed us his childhood haunts and finally told us stories about growing up on Long Island and Brooklyn. Think of this as the first teaser installment in the archives of the descendents of Daniel and Ethel Davidow (which also means that this is probably not so relevant if you aren't a descendent, or connected to one). For information on the Daniel and Ethel Davidow family mailing list, send e-mail to me. 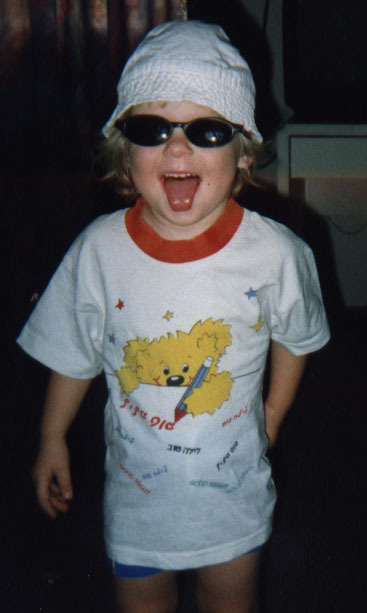 In the fall of 1994, one of my best friends, Tamar Kaufman, died. This is her memorial. She was a very special person, and I believe that she's still out here in cyberspace, somewhere. I expect an update for the page any day. Back in the early days of the web I uploaded a few pages from Don Marquis' classic Archy and Mehitabel. Page maintained by Ari Davidow, ari@ivritype.com / Last revised 7/30/02.